Hugo Chávez's Battle With Cancer: Will It Affect His Re-election Battle? 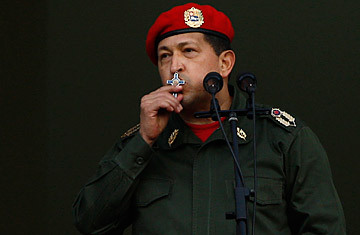 It's no secret that Venezuelan President Hugo Chávez is given to messianic rhetoric. So it was little surprise that on the early Monday evening of July 4, Chávez, having unexpectedly returned to Caracas only hours earlier from Cuba where he'd spent three weeks recovering from pelvic abscess and cancer surgery, cast his reappearance in near-resurrection terms. "It's a miracle I am here, considering how I was," the socialist leader, in his trademark red beret, said from the balcony of the Miraflores presidential palace as a sea of crimson-clad supporters waved below with a religious fervor usually reserved for Popes or rock stars. "We have started to beat the evil incubated inside my body." But as Venezuela celebrated the bicentennial of its independence on Tuesday, the country was reminded that Chávez, 56, was indeed ill. While invited Latin American leaders like Bolivian President and fellow leftist Evo Morales attended the capital's outdoor military parade, Chávez's health forced him to preside over the event from inside Miraflores, asking Chavistas to take a "long march" with him to Venezuela's next bicentennial celebration (marking its final defeat of the Spanish) in 2021. Earlier, Venezuelan Interior Minister Tareck El Aissami had insisted that Chávez's cancer  the type has still not been revealed  "will not slow the actions of the revolutionary government." But as the bicentennial festivities faded away, the western hemisphere's most oil-rich nation seemed to be left with as many questions as it was wrestling with before Chávez returned from Cuba. Chávez was visiting Havana and his political mentor, former Cuban leader Fidel Castro, when he was stricken with the pelvic abscess on June 10. For the rest of the month, there was little but silence from the fiery anti-U.S. leader until he revealed, in a brief and uncharacteristically forlorn speech from Havana on June 30, that he'd also undergone a second surgery to remove a tumor. His government had to postpone a two-day summit of Latin American leaders scheduled for July 5 and 6 on Venezuela's Margarita Island; and there were serious doubts that Chávez, who took office in 1999, would make it home for the bicentennial, where his presence seemed symbolically crucial to his re-election bid next year. With power struggles likely to bubble up in his United Socialist Party  though no one would publicly dare suggest a successor to el comandante  and with the opposition sure to receive a boost were Chávez to be sidelined for the 2012 contest, Venezuela politics looks to be on the edge of turmoil. Which is why Chávez, a p.r. maestro who prides himself on being Latin America's anti-imperialista firebrand, had little choice but to fly back to Caracas in the wee hours Monday and use the bicentennial to channel some of the aura of his Bolivarian Revolution's namesake, the 19th century South American independence hero Simón Bolívar. Images of Chávez's well-choreographed return were repeated throughout the day on state television, including sycophantic Ministers greeting him on the tarmac and even the President singing a folk song. Still, no one is sure how well Chávez will be able to handle the quotidian tasks of running a country, especially given how heavily top-down his government structure is  which was uncomfortably obvious last month as officials seemed confused, if not paralyzed, in his absence. As a result, since Vice President Elías Jaua seems loath to give any impression that he's usurping el comandante's revolutionary leadership role, the question is who will step in should Chávez be incapacitated. Only Chávez's elder brother Adán Chávez, 58, who is governor of Barinas state in Venezuela's central llanos, or plains, and who is an even more radical Marxist than the President, appeared to take the helm amid last month's uncertainty. Chávez remains the country's most popular political figure, mainly for the poverty-reduction programs he's introduced to Venezuelans who never saw much of the prodigious oil wealth before. "We give our hearts to comandante Chávez," gushed Maury Carrasquel, 46, who himself wore a red beret during the President's balcony speech Monday evening. But events of recent weeks, especially the North Koreastyle secrecy surrounding Chávez's condition early on, have also alienated a larger swath of Venezuelans already irked by his authoritarian style, unchecked violent crime and economic mismanagement  including the hemisphere's highest inflation rate. "In a country where there's so much wealth, it's a shame coming to 200 years of independence we are left so unfulfilled," says Sunil Daryanani, a Caracas oncologist. "We deserve a better explanation as to what is going on." Henrique Capriles Radonski is the man widely tipped to win opposition primaries in February and take on Chávez in next year's presidential race. Last week, before Chávez revealed his cancer, Capriles suspected Chávez would return for the bicentennial as a political gambit. "This [situation] is [meant] to generate controversy and a triumphant return," he said. But Capriles and other opposition leaders will be working hard now not to appear to be basking in and taking advantage of Chávez's illness. "The country's problems are not whether the President is or is not sick," said Capriles, whose own p.r. skills are eerily on par with those of Chávez. "The problem is what is going on in [the prisons], the electrical [outages] and all the problems that every day we must solve as Venezuelans." But Chavistas, at least publicly, will never acknowledge that their man may be on the way out. Esleé Polido, a member of one of Chávez's Bolivarian civilian militias, said Monday outside Miraflores, "I am here for the President, for the revolution and for my country. I will be here until I die." Even Chávez's opponents, of course, wish him a full recovery. But if it turns out that isn't in the cards, Venezuela could face a long march to 2012, let alone 2021. See why Chávez was silent on Venezuela's prison riot.